This morning, Theresa May tweeted this. She must have got up pretty early on a Saturday morning to make that nice infographic. Who’d be prime minister, eh? What an excellent policy! I don’t know about you, but I don’t think of this kind of basic, decent move as something I would naturally associate with the Conservatives. So, this is almost certainly good news. Most of us have probably experienced unexpected surcharges on card payments at one time or another, whether it’s at your local cornershop or when buying train tickets online. This ought to cut that out at a stroke. There’s one small problem with how Theresa May’s presenting this. And here it is: the UK government didn’t come up with the idea. It’s a requirement of the EU Payment Services Directive 2, which came into force in January 2016. Today (13th January 2018) is actually the last possible day for EU member states to enforce this part of the directive. This is also key to the policy’s success. Because it’s being introduced as an integrated requirement across the 28 member states of the EU, the likelihood of companies raising prices to compensate, or stopping card payments entirely, is probably pretty small. She, a Conservative prime minister leading a government whose sole policy is leaving the EU, is associating herself and her government with the EU to such an extent that she is willing to use the first person plural. I don’t know about you, but I’m plumping for 1. This is a huge problem in democracies the world over. Democratic governments generally don’t advertise, and that’s a good thing. And if they do, it’s generally to market new policies that are reliant on widespread public knowledge, an approach that often fails, and often because the policies are terrible. Two recent examples are the Green Deal (a catastrophic failure where the government over-promised, rushed the policy out, and failed to market it, sometimes all at once) and the Help to Buy scheme (quite good take-up, but for a policy that actively exacerbates the housing crisis). But that general lack of marketing means it’s political parties who market successes as their own, even when they aren’t. I have been giving some thought to this problem of late. It seems to me that we need some kind of independent platform – maybe just a website – that details the source, development and impact of policies, and gives credit where credit is due. Sure, not many voters would read it very often, but if done with sufficient quality and transparency, it would be a hugely useful resource during election periods – potentially making VAAs more accurate, and enabling journalists and broadcasters to refer to it. Although there is a ton of money going into new fact-checking initiatives at the moment, these tend to be reactive. This would be one way to build a bank of accurate information that could also serve organisations like Full Fact, strengthening their ability to scrutinise. It would be a major undertaking, requiring a number of permanent researchers and fact-checkers to aggregate the information, and then some savvy marketing and social media activity to promote its existence. If you’re interested in helping to create such a website or platform, I have many further thoughts. Feel free to get in touch with me via the comments, Twitter, or Facebook. I am going to explain in this post why I think a vote to remain in the European Union is the only responsible choice. I’m not going to link to sources as it would take far too long, and anyway I want it to be clear that this is my own view, based on everything I have read and absorbed during the debate to date. The “too long, didn’t read” version: On every conceivable issue, remaining in the EU would be a more sensible and fair course of action for the vast majority of people – both in the UK and elsewhere – than leaving. It is right to fear something as absurd, unnecessary, alarming and damaging as a vote to leave would be. If you don’t think my view is worth much, and you want a list of different sources on the campaign, try here. It aims to give a fair hearing to all sides. Fair warning: this post is very long so here’s a list of internal links if you want to jump straight to different sections. Will leaving give us more control over our borders? What about UK citizens living in EU countries? 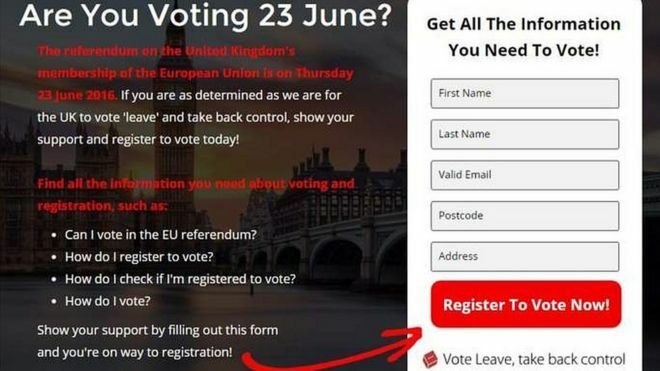 Could I ever have voted Leave? UK politics has largely abandoned the concept of the common good. In fact, it’s questionable whether it was ever supported. For almost a century British politics has been dominated by two parties, Tories and Labour, which were deliberately set up to preserve the interests of particular social groups rather than society as a whole. More than any single thing they’ve done – and they’ve done a lot – this is why I am instinctively hostile to them. There are of course other things to consider, such as gender, ethnicity, sexuality, and the rest. But for now let’s keep it simple. When I consider whether to leave or remain, I am actively trying to consider the impact on all of these groups. I want my decision to avoid harm to any of them, if possible, and ideally to create benefit for all. So now let’s explore, issue by issue, what the impacts of the referendum vote could be, and whether a Remain vote aligns with this idea of the “common good”. Like it or not, the world runs on money. A referendum on EU membership is certainly a chance to consider big, existential questions, and I do that below. But any assessment of the common good has to consider the impact on ordinary people’s circumstances. There is absolutely overwhelming consensus among economists and financial experts that a vote to leave the EU would create major short-term problems for the UK economy. Even the Leave campaign has not seen fit to contradict this assessment: their working hypothesis is that there will be a recession for a couple of years and then growth will return. That simply isn’t good enough. One of the reasons we are in a parlous state politically is because the recovery from the last recession (2008/09) was so anaemic. We are arguably in a state of hidden depression as a country, as a continent and as a world. Yet people seem to have forgotten that the impact of that recession was hugely disproportionate: as with every major financial crash, it was people on low and middle incomes who suffered, and continue to suffer most. The Leave campaign has taken an incredibly narrow approach to economic matters. They have focused on the idea that if we leave the EU, we will have more money to spend, as we won’t be paying our fees any more. They have lied about how much this will save the country time and time again. And they have totally failed to engage with the wider benefits that being part of the EU club brings the UK economy. Worse still, they have entirely failed to set out clearly what their preference is for a new deal after we exit the EU. At various times, they have implied that they like the idea of having a deal with the EU along the same lines as Switzerland, Norway, Iceland, Canada, and even Albania. But they have never specified which they would pursue – and there are immense problems with all of these. For example Norway still makes significant financial contributions to the EU, has to accept the vast majority of EU regulations, and (worst of all for Leave) has to embrace free movement of people – without having any say on the rules. Britain’s clout in the EU is considerable when it comes to economics, and we have successfully used our influence many times, not least to defend London’s competitive advantage on financial services. The UK government also succeeded in appointing its current EU commissioner, Lord Hill, to a vital and powerful role, overseeing the entirety of the EU’s work on financial stability, financial services and capital markets union. Here’s the economic reality of Leave: we don’t know what we’re getting into. We don’t know what kind of deal our political overlords will attempt to make. It is highly likely that the EU and large economies like Germany and France will want to make an example of the UK in order to dissuade other countries from following in our footsteps – and that is its right. We will enter a period of economic recession, perhaps depression. The impact of this will not just be on the UK but on the EU and on economies around the world – including the US and China. Lives will be ruined. Jobs will be lost. There will be less money available to pay for public services and social security safety nets. And we will be led by a political party, and likely by a prime minister, whose response to recession is austerity. How do we know this? Because that is what they did last time. This is a theme I’ll keep returning to, because it’s very important to recognise it. If we vote to leave the EU, we will still be led by the same government that is in charge today. That means a majority Conservative government, probably with a new prime minister – and that prime minister seems highly likely to be either Boris Johnson or Michael Gove. (The other options – George Osborne, Theresa May, Philip Hammond – aren’t exactly cuddly One Nation types either.) The Conservative party is not there to represent the majority of people: it is there to represent the minority of wealthy, older people who keep it in power. The combination of huge economic uncertainty, an economy only gingerly recovered from one of the biggest recessions in history, and a Tory party even more hellbent on destroying the state’s power to intervene positively in people’s lives is not one I can vote for in good conscience. So the economic argument for Remain is overwhelming from a UK standpoint. It isn’t just about the UK, though. A decision to leave would also have a major impact on the credibility of the EU as an institution capable of stimulating economic prosperity. It is probable, although harder to predict with confidence, that a nation of the UK’s size moving towards the exit would create sufficient upheaval and uncertainty that the entire bloc might fall into recession. That is no small thing given the travails facing some of the EU’s weaker economies. Greece is in a parlous state but several other nations are also in danger – Italy being the most pressing. Destabilising the European economy would be one thing if it could be set against obvious economic gains for the UK. As it is, though, even the Leave campaign recognises that the short term consequences of exiting the EU will be negative. Again, then, the economic argument is for Remain. A wider issue for some Leavers seems to be that the UK puts more money into the EU than it gets back. This betrays their inability to see beyond national borders and empathise with other nations; at heart, it betrays their belief that economic redistribution is simply wrong. As someone concerned with the common good, I cannot go along with that view; the UK is one of the richest nations in the world (for good reasons and bad) and should be proud to give some of its wealth away to poorer countries. Without the EU in place, that becomes less likely: European countries do not tend to be considered impoverished enough to warrant overseas development aid (ODA), and with Gove or Johnson in Downing Street the likelihood of major increases to ODA spending is slim to say the least. Then we can also consider those countries that have yet to join the EU, but wish to. I currently live in Bosnia and Herzegovina, a beautiful country that suffers from the legacy of a peace agreement, the Dayton Accords, that froze into place the ethnic divisions that had erupted into war. Like many of the other countries in the Balkans and on the eastern fringe of the EU, it is in the grip of corruption and organised crime. It desperately wants to join the EU and access the single market. The EU is using that desire to encourage change in the country – improved regulation, better environmental standards, and the introduction of border controls, for a start. The same process is going on in several other countries and has been for some time, as part of the EU’s enlargement process. Progress on reform means access to valuable EU funding. This is excellent evidence of the benefit of an expansionist supranational institution where core members are committed to the prosperity not only of its existing members but of prospective joiners. To me, it is one of the EU’s most laudable goals. A British exit puts all of this at risk. The EU is at a low ebb in any case, lacking confidence and being chipped away at by petty nationalism. If we undermine it further by withdrawing our consent for the overall project, the European continent loses one of its best ways of securing future prosperity for developed and developing economies alike. The impact of Britain’s exit from the EU on the global economy is less certain. Leading American economist Janet Yellen, the chair of the Federal Reserve, is on record as of yesterday saying that Brexit could delay an interest rate rise and hit overall demand in the US. She warned of ‘significant economic repercussions’, something that other major economies around the world will also be concerned about. It’s certainly possible that the uncertainty created by an economy of the UK’s size and importance being shaken to this extent could plunge the entire global economy back into recession. However, I think the main point to make is on the long term effects. By 2030, the three major economies of the world will be the US, China and the EU. Other national economies show no real sign of growing quickly enough to bridge the gap to these titans. Moreover, China is slowing down from its period of miraculous (unbelievable?) growth, while other emerging economies like Brazil and Russia are currently captured by corruption and organised crime, showing no real sign of improvement. Brazil in particular is in a dreadful state politically and economically. The idea that the UK standing alone will somehow be in a position to forge ahead outside the EU, building bilateral trade agreements with whomsoever it chooses, does not resemble reality in any form. There have already been warnings from the President of the United States and from the head of the World Trade Organization that any new trade deals will be extremely costly and time-consuming. The one saving grace in this may be that London is no longer viewed as the preeminent home for dirty money. But at the same time, there will be far less incentive for the UK to take a leading role in tackling corruption if we are seen as a small-minded pariah state rather than as a prominent global power. And the thing is, there are already ways to deal with that unwanted reputation now: we already have the ability to clamp down on tax evasion and avoidance, put people in jail and fund investigative work that exposes the structures enabling offshore tax haven usage. So, again, based on the wider economic ramifications, I can’t see a good argument for voting to leave the EU. Will leaving the EU actually give us more control of our borders? Let’s turn to the reason many Leave supporters want out of the EU, then. You will find time and again that this trumps (pun intended) the economic argument for lots of people. The argument runs that it may be even worth giving up some temporary economic security if it means regaining control of our borders. Nigel Farage is on record as saying that he wouldn’t personally object to being poorer if it meant we could keep people out who we don’t want. The reason people want to come to the UK is that we are a successful country. What these people are saying, in essence, is that they are prepared to run down the UK in order to make it less attractive for new citizens, forgetting that this also harms its own citizens. It’s a remarkable argument to make, as it also totally ignores what many people are trying to escape: they can be fleeing conflict of course, but they can also be fleeing the result of historic conflict and political instability. There’s no attempt at all on Leave’s part to understand this or to empathise, only the narrow-minded belief that the UK deserves to be suspended in some sort of sepia-tinted stasis (or ideally wound back to a time when there were fewer immigrants already fouling our golden shores). Of course, the myth behind the myth is that immigrants are robbing us blind twice over: stealing our jobs and also taking vital resources through the UK’s generous benefits system. Obviously, both cannot be true, but lies like this have taken hold to such an extent that they are no longer questioned. The fact remains that you are more likely to be treated at A&E by an immigrant than standing in the queue behind one. Time after time, evidence shows that EU migrants contribute more to the economy than they remove, and that the people who are the biggest burden on the British economy are, well, British people. I wouldn’t exist were it not for the generosity of previous generations towards immigrants. My mum is Indian and I am half-Indian. While India isn’t in the EU, there are millions of people in the UK in the same position as me from all sorts of European backgrounds. To see the country I was born and raised in turn away from that position of open-minded generosity sickens me. So it’s clear I don’t agree with the Leave campaign’s attitude on immigration. In fact, no major party is adequately pro-immigration for my liking – not even my own, the Liberal Democrats. Labour, and the Lib Dems to a lesser extent, have allowed themselves to be dragged into a race to the bottom on immigration rhetoric that is poisoning our country from the inside out. But all that aside, would leaving the EU even have the effect the Leave campaign claims? I’m not so sure. It is undoubtedly true that, having left the EU, we would initially regain total control of our own borders. The implications of that are more complex than you might think, though. First of all, the UK-France border could no longer be in Calais, but in Dover. The Le Touquet agreement was negotiated on the basis of the UK’s membership of the EU, among many other things, and there is no guarantee that it would continue; French ministers have already made noises to the contrary. That means the dreaded “Jungle”, so despised by right-wing tabloid newspapers, could come to Britain. Secondly, and more importantly, the Leave campaign has sporadically suggested that a new deal would be done with the EU to enable trade to continue. As discussed in the Economics section, they have never set out what this would look like. However, we can probably assume it would look something like the agreement that set up the European Economic Area. Other countries involved in this – Norway, Iceland, Switzerland and Liechtenstein, all members of the European Free Trade Association – have not only had to accept the principle of free movement, but have gone further by joining the Schengen Area. If you don’t know what Schengen is and you’re anti-immigration, listen up: Schengen enables passport-free travel without any kind of border control. It basically acts as a single country for travel purposes. I personally love the idea of Schengen, and wish the UK had not opted out of it. But if you are anti-immigration and like the idea of border controls, I hate to break it to you, but EU migration is actually likely to get “worse” and more difficult to control if we leave the EU than if we stay in it. You might argue that Britain will somehow negotiate a better deal than any country before it has. But the EFTA countries were able to negotiate their deal from a position outside the EU, rather than after leaving it – a far stronger position – and look where they ended up. To think the UK is somehow immune to the negotiating power of the world’s largest trading bloc is wishful thinking in the extreme. So, whether you’re pro- or anti-immigration, staying in the EU appears to be more beneficial for the UK than leaving it. It shows both that we are committed to being an outward-looking country and it means we won’t have to cede further control of our borders. This is another important question. There are around 1.2 million UK citizens living elsewhere in the EU, while 3 million EU citizens live in the UK. It is a real shame that the vast majority of these people have been denied a vote, given their lives could conceivably be changed significantly by a decision to leave. While deportations of existing residents are unlikely, there’s every chance that countries with sizeable populations of UK immigrants like Spain and France could introduce new charges to access public services, levy additional taxes on UK-owned property, or introduce new requirements to allow children into the school system. Without some concessions to freedom of movement, too, it makes these people’s lives far harder – their families may find it more difficult to visit on short notice, or they may have trouble getting access to healthcare in an emergency. That could, in turn, increase the number of people returning from overseas. They won’t be young, eager, energetic people looking for jobs and a chance in life; they’ll be old people looking for housing having sold property on the Algarve or in the Dordogne, driving up property prices further and unlikely to contribute to the economy in any useful way. Some of the concerns around this question have been overdone by the Remain campaign, but we shouldn’t simply discount it as a consideration. If the purpose of political decisions is for the common good – and if you were in these people’s position – what would you do? This is probably the issue I’ve had to debate most during this referendum. The issue of democracy has been placed at the very heart of the Leave campaign. The claim runs that the EU is unaccountable, and that there is a democratic deficit. The theory is epitomised by Michael Gove’s vivid statement that “one of the most powerful symbols in our democracy is the removal van”: this is another way of saying that if you can’t kick out the people who make decisions and laws on your behalf, then the system you’re in can’t be called a democracy. First off, let’s recognise something: the EU could stand to be more democratic. The Commission, in particular, has too much power. It should be recast as a proper civil service, depoliticised entirely, and its monopoly on proposing legislation should be ended. The simplest way to do this would be to give more powers to the European Council, asking them to propose concrete legislation rather than set a direction of travel, and to the European Parliament, which already has powers to initiate legislation. It should be noted that the Parliament has had its powers significantly extended by recent treaties and has intervened decisively twice in recent times to remove or challenge the Commission; removing Jacques Santer’s corrupt and fraudulent regime in 1999 and forcing Jose Manuel Barroso to reshuffle his team before taking office. The EU as a whole also needs to do a far better job at educating its citizens – in every Member State – as to what its institutions do, who we are electing when we vote, and why it matters. And serious thought should be given to the problem of subsidiarity. While David Cameron has secured a deal on this – the so-called “red card”, where national parliaments can object to a law so that it is amended or withdrawn – the importance of transnational issues should be sufficient to warrant a strong program of activity without resorting to tinkering with tiny issues. We have an unelected, hereditary head of state. We have a head of government – the prime minister – elected by a self-selecting group of political obsessives (party members) rather than directly by the people. This means that the position can be vacated and filled mid-term without recourse to the electorate, as has happened twice in my lifetime. We have a government appointed from the elected legislature. Ministers are not required to be confirmed in their positions by the Parliament (unlike in the EU). We have a Cabinet personally selected by the prime minister and that can be changed on a whim. We have a whole House of Parliament that is unelected. People are appointed to it – political patronage, obviously open to abuse and corruption – unless they happen to be a high-ranking Bishop or someone whose male ancestors were Earls. The prime minister can appoint people to his Cabinet who aren’t in either House of Parliament: he does this simply by making them a member of the House of Lords. UKIP has 0.2% of the seats on 12.7% of the vote. In short, the UK has nothing to say to the EU on democracy. Our system is as broken as it gets. The total lack of any kind of positive proposal from the Leave campaign on reform of the UK’s democracy shows just how little they value the concept itself. Layer on top of that the current UK political situation and things start to get really ugly. Who are the people we are going to give more power to if we leave? The current majority Conservative government is appalling in all sorts of ways. It is kicking out legitimate immigrants vital to our education and healthcare systems in the name of hitting a target it will never reach. It is attacking our civil liberties by introducing mass state surveillance (with Labour’s blessing). It is trashing our decent record on the environment by reducing investment in renewable energy and encouraging fracking. It is threatening to destroy the BBC’s place in our society as a neutral source of political coverage and as a producer of high quality TV and radio. Worst of all, it is standing firmly against any attempt to reform our democracy, and actually attempting to make things worse by cutting opposition funding, forcing through boundary changes, etc. Meanwhile, there is no prospect of any party seriously challenging the Conservatives while Labour is led by someone of such limited calibre as Jeremy Corbyn – and you’ll note I’m not even getting into his actual politics. We face at least nine more years of the Conservatives, and even if we stay in the EU, that gives them plenty of time to destroy what is left of our country’s best qualities. At least the EU holds them back to an extent, and other European institutions guarantee our human rights. Leaving the EU will only encourage attempts by senior Conservatives to remove the UK from the European Convention on Human Rights – something the Home Secretary is already advocating. In summary: UK democracy is in a parlous state, and removing EU oversight from the government is likely to result in significant further harm. The EU has shown more promising signs of reform in recent times than the UK has, and is starting from a better place. So, once again, it is clearly right to vote to stay in. Of the two sides, only Remain has shown any kind of active and tangible commitment to democracy. This only bolsters my view that staying in will be the better course for those of us who consider ourselves democrats. The sovereignty argument is very important to the Leave campaign. Along with the idea that we can rid ourselves of the “undemocratic” EU, the idea that we can “take back control” by quitting the institution is literally their campaign slogan. The argument is that we have given away control of the key decisions that affect our lives to a load of unaccountable bureaucrats. As I said above, they feel so strongly about this that they are willing to risk economic pain (if not for themselves, then for the country at large) to regain parliamentary sovereignty. The problem for me here is that it’s very clear that sovereignty is not a binary concept. If we want to be black and white about things, the UK Parliament is clearly sovereign over our EU membership; if they so chose, they could simply repeal the 1972 European Communities Act and we would be out. Such a move would be mercifully quick in comparison to the interminable campaign we are currently experiencing. But in day-to-day matters, yes, EU membership does impinge on national sovereignty. EU law can overrule UK law. The European Court of Justice can effectively veto acts of the UK Parliament. It’s worth constantly reappraising whether this is a price worth paying for our membership. The truth is, though, that we make trade-offs about sovereignty all the time. That is what international treaties are for. Throughout Britain’s history we have been involved in treaties that required us to act if another nation was threatened or invaded; that is why the First World War happened. That is how NATO also works. Standing alone – what Nigel Farage would call “independence” – can make you weaker if it reduces your influence or makes you more reliant on fewer allies. 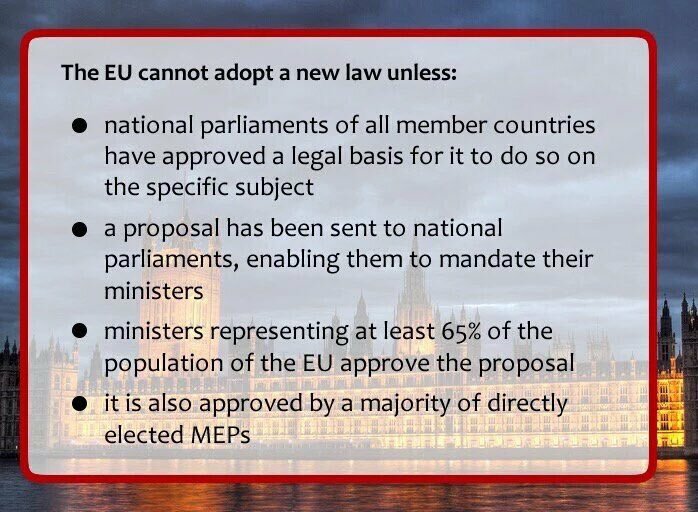 One of the reasons we think so little of the EU is that our own Parliament is terrible at scrutinising the laws that come from Brussels. The House of Lords takes a more active role than the Commons in doing so and MPs, who are in any case hugely overworked, take little interest in the intricacies of obscure European regulations. They have enough to do rubber-stamping the government’s statutory instruments. In discussions on this aspect of the referendum I frequently find myself banging my head against a brick wall, though. There is a sizeable number of voters who genuinely believe that the UK has somehow given itself away to Europe, and that only by leaving can we ensure we do not lose our sense of self. I just cannot identify with that. To me, part of the richness of the EU is in travelling from country to country (easily, thanks to being an EU citizen) and seeing just how well preserved the sense of national identity is. It strikes me that the chippiness of the Leave campaign proves pretty well that we have lost none of our Englishness. Our world is increasingly borderless in every important way – financially, culturally, and technologically. There is no way to turn back time and no way to pull up the drawbridge. I want the UK to be a modern, successful nation that plays its part in all major international institutions. That means voting to Remain. A final thought on this issue: our sovereignty will almost certainly be immediately diminished if we leave the EU. We will lose Scotland, and possibly Gibraltar. A movement for independence in Wales could well begin. Who knows what might come next. It really could be Little England, a tiny nation with limited resources, reliant on its shrinking financial services sector, forced to become an out-and-out tax haven to survive. The debate on foreign policy, and defence, has become extremely poor in the UK. The general election last year lacked any real sense of what is happening outside the UK. The only small reference to defence policy was about the renewal of Trident, on which both major parties agree, but they managed to find a way to argue about it anyway. The only other area of debate where foreign and defence policy crop up is through the prism of the immigration debate. This shows just how parochial and selfish we have become. Rather than talk seriously about solutions in Syria, we are more concerned with dealing with the aftermath by keeping out the refugees. That neither helps the refugees in question, who are frequently so desperate that they are willing to risk death to escape death, nor does anything to address the real problems in the region. This bad situation is made worse by the fact that Europe, the continent, is at its most vulnerable for some time. The threat posed by Russia to European and global stability is significant. Putin is a vicious dictator who does not ask “why”, but “why not”, and responds to weakness with further aggression. People in the UK seem to be ignorant that Russia continues to invade other country’s territory and, through insidious media networks and online trolls spreading mendacity and misinformation, is continuously attempting to undermine governments in the entirety of Eastern Europe. Meanwhile, across the Atlantic, our main non-EU ally is readying itself for a two-horse race between Hillary Clinton and Donald Trump. While I am confident that Clinton will win, nothing can be discounted in a two-horse race, as we’ve seen with this referendum. Trump is the wild card to end all wild cards, and senior Republicans who were earlier dismissing him are now falling into line behind him. The total lack of discussion about what any of this means for the UK is shocking. Only the Remain campaign has really tried to raise the issue, although it has been tentative and weak in doing so. But surely this is a very real consideration. Without EU membership and cooperation, the UK will be heavily reliant on NATO. Yet Trump himself has called NATO obsolete and thinks that it needs to pivot towards combating terrorism, something that is probably linked to his well-attested admiration for Vladimir Putin. That admiration is reciprocated in the Kremlin, which has already endorsed Trump’s candidacy. Putin himself could not be more clearly attempting to destabilise the EU. He likes to deal with nations one-on-one, where brinkmanship is part of the game. A united, multilateral, supranational institution like the EU is probably his idea of hell, partly because it reminds him that the Cold War was lost. While he has been careful to avoid being seen to intervene directly in the referendum campaign, it’s very clear that Russian state propaganda channels like Sputnik and Russia Today (RT) are pumping out the Brexit message – Farage is frequently to be found on RT – while Putin has also been travelling to other EU countries such as Greece to try to warm up relations and ensure that a future outside the EU becomes more attractive. Trump may not win. But I am hardly confident, and I certainly don’t want to be outside of the EU if he does. We are going to need all the help we can get in that horrifying scenario. The European Convention on Human Rights is not part of our relationship with the EU. It is a separate document to which we are a signatory, drafted by the Council of Europe at the recommendation of British Prime Minister Winston Churchill and with the oversight of British MP and lawyer Sir David Maxwell-Fyfe. The European Court of Human Rights was established by the Convention. As such, leaving the EU will not directly affect the UK’s position on human rights in itself. We will continue to be a signatory to the Convention and cases will continue to be heard in Strasbourg. However, it would be ridiculous to suggest that there would be no impact on the wider human rights debate. The current Conservative government came to power on a pledge to repeal the Human Rights Act and replace it with a British Bill of Rights. They have found this near-impossible for many reasons. Withdrawing from the Convention might solve many of them, but by no means all; the problem of the Good Friday Agreement would remain, for example. The impact of exiting the EU would be to renew the focus on the ECHR as just another example of meddling supranational institutions standing in the way of British justice. The number of myths peddled about the ECHR is already staggering; if the Leave campaign’s lies succeed, then that will only encourage the nationalists in the media to begin the next round. I like the ECHR much more than I like the EU, and believe that anything that puts such an authoritative, powerful defence of human rights and civil liberties in jeopardy must be resisted strongly. Therefore, this is another reason to vote Remain. The final piece to this puzzle is the principle of intergenerational equity. What’s that, you ask? It’s the idea that each generation should bequeath to the next the same privileges it has enjoyed. To put it another way, successful generations should not pull up the ladder behind them to prevent young people from leading good and happy lives. The baby boomer generation, born in the 15 years after the end of the Second World War, has had an unprecedented degree of good treatment and good fortune. Being of a certain age, they grew up used to the idea of Britain as a proud nation: proud of having stood alone against the Nazis, proud of being the country of Churchill and Monty and the Dambusters. But as they entered their teens and their twenties, they also reaped the benefits of an economic recovery and a political class that understood the importance of social infrastructure. They also benefited from free or very cheap university education, if they went. They benefited from low house prices and have seen their property appreciate in value many times over. They own houses that are too large for their present needs, and very often they own more than one. They even got to see England win the World Cup, for goodness’ sake. In older age, they have been protected from the worst effects of the 2008 recession thanks to a coalition government that introduced one of the most generous systems for uprating pensions that can ever have been devised. I still wince to think that it was a Lib Dem minister that was responsible for the ‘triple lock’, a policy utterly in favour of the Conservatives’ natural constituency. To put it bluntly: baby boomers have had it better than any other generation of people in the UK, and the generations coming after them are experiencing a lower standard of living. This is well-attested. It may sound strange to that cohort of people, because after all, there’s always someone better off than you, isn’t there, but it is true. By contrast, my generation in the UK – the so-called ‘millennials’ – is generally outward looking. People aged 18-40 are overwhelmingly pro-EU. We grew up in the open world of the internet and of regular travel by air. We do not really experience national borders in the same way as they used to be thought of; we certainly haven’t experienced what it is like to have to defend them from attack. We like the EU because we can study and work where we want, and because it is reducing the cost of using our mobile phones while we’re escaping from the British weather. We tend to be equally suspicious of all authority, and perhaps more suspicious of authority closer to home. We know we get shafted regularly by a government that doesn’t really care about young people, because they don’t vote. I graduated in 2008 as the recession tore apart the global economy. I applied for around eighty jobs before I decided to take an unpaid internship, and I could only afford to do that because I had generous support from loved ones. Most people my age other than the trustafarians are painfully used to paying most of their wages in rent, gaping CV gaps, taking bar work or manual labour, endless short-term or zero-hours contracts. Most of us have accepted that our most cherished skills and creativity may not be applied to work we actually enjoy for some time – if ever. Hugo Young once said that Britain’s relationship with the EU is “a perpetual struggle between the future it could not avoid and the past it could not leave behind”. A more brilliant encapsulation of this referendum is hard to imagine. Older people should think very carefully about the country they want to leave to their children and grandchildren. To take the UK out now will be a final insult to the generation that will be paying – despite flatlining or shrinking salaries, no property assets and poor pension provision – for the baby boomers’ social care. As a Liberal Democrat, I recognise that the European Union project is very problematic. There are many things I would change about the structure of the EU and the way it functions. One of the biggest problems with the Remain campaign – and David Cameron’s petty, small-minded renegotiation before it – is that it has failed to articulate any kind of reform programme for the future. Many of the criticisms levelled at the EU have considerable weight behind them: it is opaque, difficult to understand, and often lacks democratic accountability. I have worked with EU officials and navigated its innards for long enough to understand why it takes so long to get things done. Moreover, insufficient work has been done to prepare the ground for lofty ideals like ever closer union; political integration simply must precede economic reform if it is to be sustainable. We believe that the EU is a noble idea, but one that can’t match up to the reality of vast differences in culture, economic performance and political beliefs. Power is best put in the hands of the people – and should only move upwards when it is essential for decisions to be taken together. The EU has taken too much power from national governments. There’s a case to be made for a single market and for cooperation on specific issues like crime and terrorism. But no country in the EU is incapable of managing its own affairs. The benefit of this approach would have been that it is honest about potential downsides to leaving the EU. It offers some serious ways to empower British citizens and preserve or improve the UK’s place in the world. Sadly, we are not being offered anything like this. If we had, I would be seriously considering voting to leave.